This is, without a doubt, one of the easiest recipes you could ever try your hand at making. These cakes are still made in Egypt and Turkey, and have been around since early Greek and Roman times. You can find similar fig cakes sold at cheese shops and Whole Foods for ridiculously astronomical prices for what they are. Palathai are cakes made of figs. 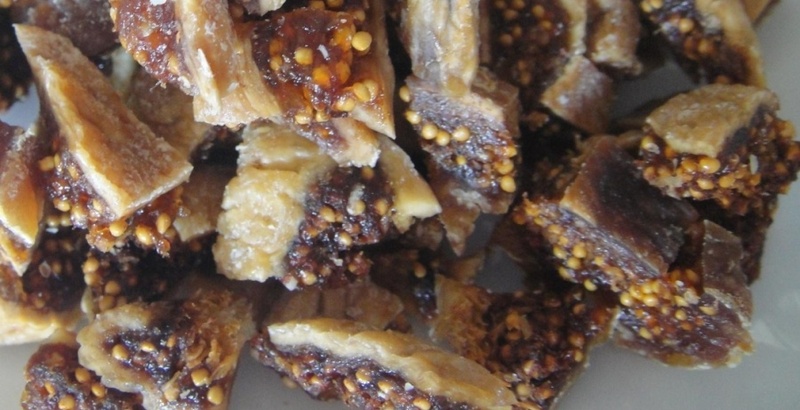 And cakes of palasiai, that is of dried figs that have been squashed. Remove any fig stalks and use a food processor (or blender) until the figs form a sticky paste. Take the paste in your hands and form a dense, round, flattened cake. Mix together the flour and coriander and dust the outside of the cake with the mixture. Cut into small wedges. Leftovers wrapped in plastic will keep for a week.